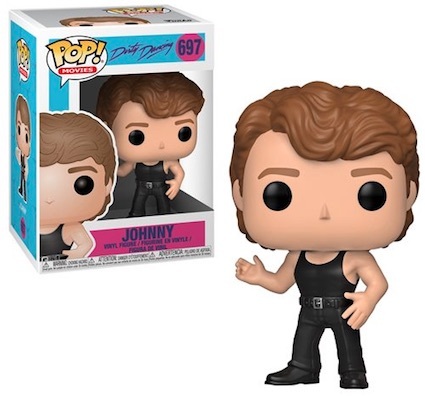 Product DetailsPerhaps the only instance where putting Baby in a corner is okay, the Funko Pop Dirty Dancing figures honor the classic 1987 film with vinyl options for Baby and Johnny. Just be sure you are only putting Baby in the corner of your desk or shelf. Both clearly in a dancing mood, the Funko Pop Dirty Dancing set includes Jennifer Grey as Frances "Baby" Houseman, who is dressed in jean shorts and a pink tank top. Joining her is Patrick Swayze as Johnny Castle, wearing an outfit consisting of black shoes, pants and tank top. Shop Dirty Dancing DVDs on Amazon. That's mostly it for now but Funko Pop Dirty Dancing does offer an exclusive two-pack for Baby & Johny that is only issued at Target. Check back for more Dirty Dancing Pop details and let us know if you spot any other figures from the set. Click on the links to shop for specific figures on eBay. Funko Pop! DIRTY DANCING Exclusive! BABY AND JOHNNY 2-Pack! Brand New in hand!